Is a DeShayes Court expensive? A DeShayes Court is an investment, a quality improvement to your home. It may well appreciate in value. In addition, you and your family will enjoy hours of fun and fitness! 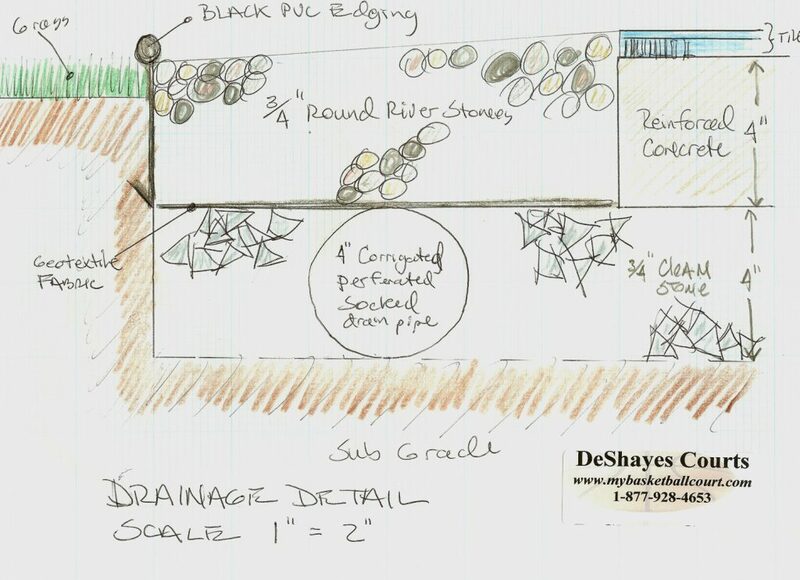 A DeShayes Court is an innovative, economically sound enhancement to your property and a great use/value return for your family, friends, and neighbors. Prices range from $5,400 for a driveway courts to $100,000 or more for regulation tennis courts with lights. We install our courts year round. Weather is a factor. However, the installation of a game court normally takes about 2 weeks of actual construction. First, we work with you to design the game court. Then we clear and prepare the site, including leveling and compacting the area. Adding a layer of geotextile fabric, then 4 inches of ¾” clean stone is installed on top to insure proper drainage and eliminate frost heaving. Next, we set concrete forms for least deviation of elevation, set the anchors for basketball systems, install ½” rebar 30” on the center in two directions, place 4000 psi concrete with fiber mesh, and finish the concrete slab with a light broom finish. Once the concrete is ready, we install the basketball systems, DeShayes sports tile, lights, nets and fencing if needed. Then you are ready for years of family fun and entertainment! Why use 3/4” clean stone at all? In colder temperatures, where ground water can find its way under concrete and freeze, we use 3/4″ clean stone. This allows water to recharge back into the ground and any remaining water has room to expand when it freezes in the 3/4” clean stone. This will NOT happen with any other fill material. Thus, the concrete can survive repeated freeze-thaw cycles without failure, which allows us to guarantee your court for 10 years and have it last well beyond. Why does a DeShayes game court offer better game performance? Our ¾” shock absorbing suspended surface reduces player fatigue, skeletal trauma, shin splints, concussions and many typical injuries associated with concrete and asphalt; and provides better ball rebound. Our Premier Suspended Court Surface is better for tennis, basketball or any other traditional hard court activity. How will my game court fit within my landscaped backyard? In addition to creating an environment for safe family fun, we also add lasting value to your property. We work diligently to integrate your court system into your current landscaping theme, and thereby increase the value of your home. Your new court will be a luxurious addition to your home yet prove to be a practical investment. 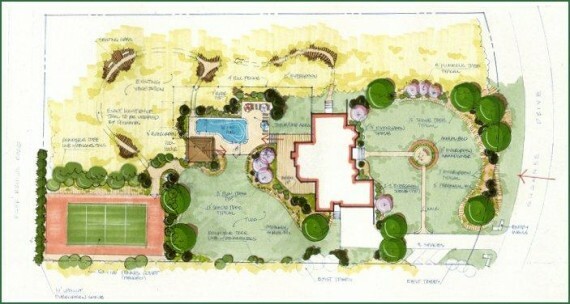 Having taught an accredited course on the proper design, construction and maintenance for all types of courts to the American Society of Landscape Architects, in addition to having a background in landscape architecture and judging numerous design competitions, owner Joe DeShayes will be able to use that experience and knowledge in providing you with the best options and location for your court that will give you and your family many years of enjoyment. Once a deposit is received we will email you a tentative schedule that will contain the company owner’s personal cell phone number, and he will be available 24-7 for any questions or concerns you may have. An email will be sent to notify you of any changes in your original schedule, as well as a weekly update. What happens to my yard during construction? We take whatever measures are required to protect your property during construction. We advise you of various options to that end. Some options may increase the cost of getting materials to the site, but still be the better choice with regard to protecting your yard. Over the years we have done installations on many beautiful properties. We appreciate the care and expense invested to design, build, and maintain them. We take the time to determine the best way to get your court built with minimal disruption. 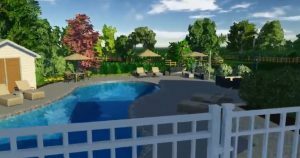 Once your DeShayes Dream Court is complete your yard will look just as it did prior to construction with the exception of a beautiful DeShayes Dream Court that will provide you and your family with a lifetime of enjoyment. 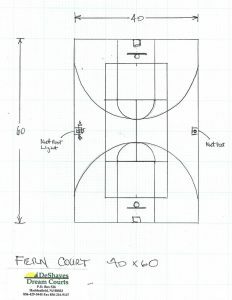 Site evaluation and attention to drainage are important steps in building a quality game court. We investigate and address existing landscape drainage issues before construction begins. My current tennis court is cracked and weeds are growing through. Can you help? The advantages of retrofitting your existing concrete or asphalt court with our Suspended Surfacing are plentiful. You will eliminate unsightly cracks, puddles, stains and patches. You will eliminate down time due to puddles because rain quickly drains away. Annual maintenance and repair costs are dramatically reduced. And the overall reduction of knee, ankle, and lower back injuries and fatigue is a benefit for everyone. If major repairs are required the sport tiles can be removed, pulled to the side, and put back after the repair has been made, saving you +/- $8,000 to repeat the service after a crack or base repair. Concrete allows us to build a better court, guaranteeing the base for 10 years. One of our chief concerns is durability, and steel reinforced concrete meets that goal. Equally important is planarity of the surface. Concrete can be perfectly planed, asphalt cannot and would always have the possibility for dead spots as related to ball bounce. On a DeShayes game court you will experience years of enjoyment because we used the combination of a concrete base for a durable foundation and a suspended sports surface for player comfort and safety. Why use steel in the concrete? Using steel reinforced concrete is important. Our normal concrete specification is 4 inches of 4000-psi concrete installed over a sub-base of 3/4″ clean stone on top of a geotextile fabric. We use 3/8-inch #4 steel rebar 30 inches on center in two directions creating a checker board of steel throughout the slab giving the slab additional structural strength. When the two products are properly integrated they create a much stronger and more durable support structure than either alone which allows us to guarantee your base will be playable for a minimum of 10 years (asphalt comes with a 1-2 year guarantee not including puddles). Is it difficult to keep my game court in working condition? Durability and maintenance are top considerations and DeShayes Dream Courts excels at both. Our game court surface requires very little maintenance. When necessary, clean it with a leaf blower or remove snow with a plastic shovel and it’s ready for play virtually year-round. We are the only company in the industry with enough confidence in our material selection & installation methods to guarantee our courts for 10 years. The majority of the other companies offer a limited warranty from the manufacturers that is nothing more than a page or 2 of all the items they will not repair or replace, or they will charge you for whatever they fix. With a DeShayes Dream Court you only pay one time for 10 years of enjoyment. Once a year for each of those ten years someone from our team will visit your court and change the basketball net, touch up the paint on all of your components, grease & WD40 all moving parts, clean the backboard, replace the net if needed, and blow off your court so it will always look great and function properly for you, your family, and friends. I don't have much room in my back yard. How do I know if a DeShayes court will fit? At DeShayes Courts, we specialize in dealing with the many departments and ordinances of your local government. 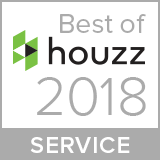 Just send us a copy of your survey along with your address and we will be able to determine the size options and location for a court on your property. We custom build your court to fit your yard and your budget. We build your game court to play the games you and your family prefer, while fitting your yard and your budget. It’s the place for family fun and fitness! We have many sizes, designs and game options available. A master plan for your property is similar to the architectural plan for your home in that it illustrates outdoor rooms and spaces for your property. There are several steps that must be taken to develop a master plan that will meet all of your needs now and in the future. The first step is a site analysis listing all of the assets and liabilities of your property along with researching your town’s zoning ordnances, and how they will effect your design options. A list will be compiled of all the things you want to do on your property, the amenities you are considering, and general budget numbers for these items so you can asses your value to them. It is also important to consider how you want things to feel and the style and/or styles you are contemplating. Once you know what you want there are many layouts that can accommodate your needs. It is important to understand how spaces relate to each other and this can be accomplished by relationship diagrams. Now that a general layout of spaces has been developed and chosen you are ready to review several general design concepts and move on to two detailed designs with sketches. This will give you choices for your final design solution which can be presented as a life-size 3D presentation in which you can literally walk through your design before it is built. This gives you the ability to see your property from every angle imaginable and make any changes necessary in the design stage, where they are the most cost effective. With a well conceived master plan you will have the ability to install your project all at once or in stages and have the assurance that when it is complete it will look as though it has always been a part of your property and everything will fit together cohesively. Please call our office for an initial consultation in which the process can be explained in detail +1-877-928-4653.